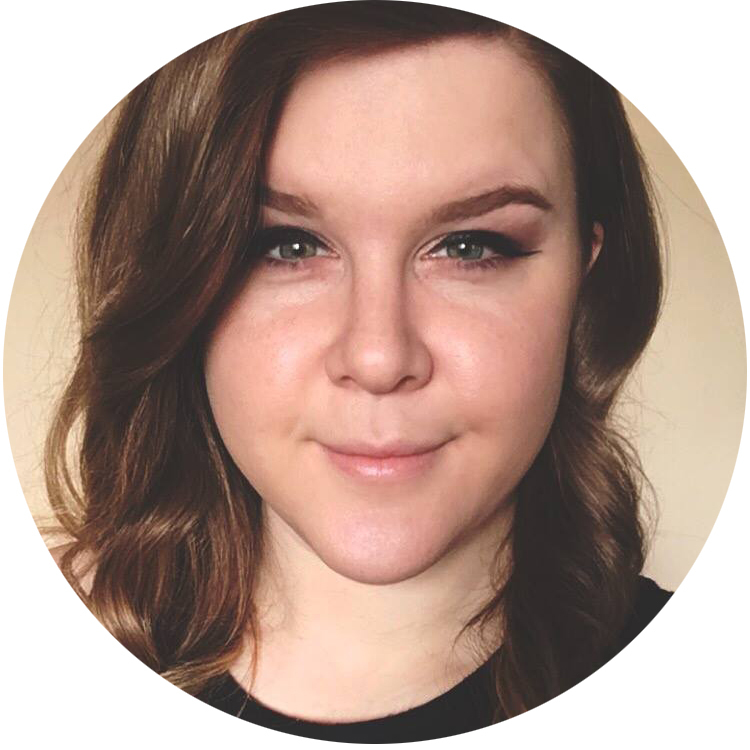 Seems like tons of us are going for the challenge - I've seen just about every version possible of it on blogs from across the world. Good luck! I'm sure we won't mind some double posting but don't burn yourself out either. I was planning on starting this in October. I think I might try this! 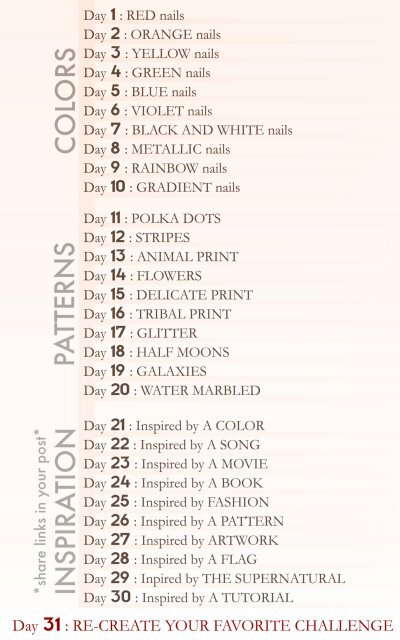 A couple of these will be big challenges for me (water marbling, animal print, stripes....). But I'll try! Yes, I think I'm going to have to try this. 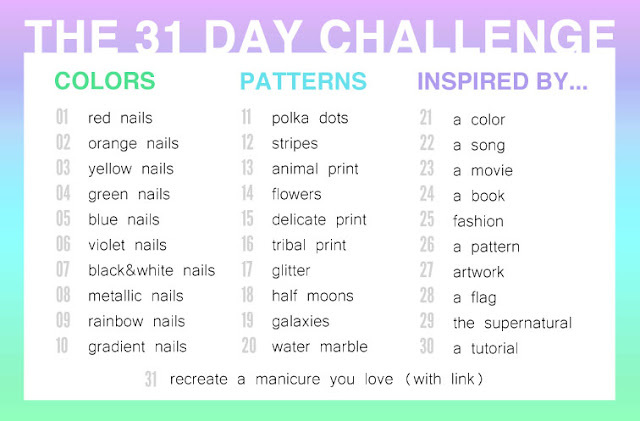 I've seen the 31 day challenge posted on others blogs and I can't wait to see what you create. It's going to be awesome especially when you get to the patterns! Joyce, you can still add your photos to the Inlinkz that others will be doing! All you need is a free photo host like Flickr or Picasa or Photobucket. Click on the "Inlinkz collections" link in the post for more info. 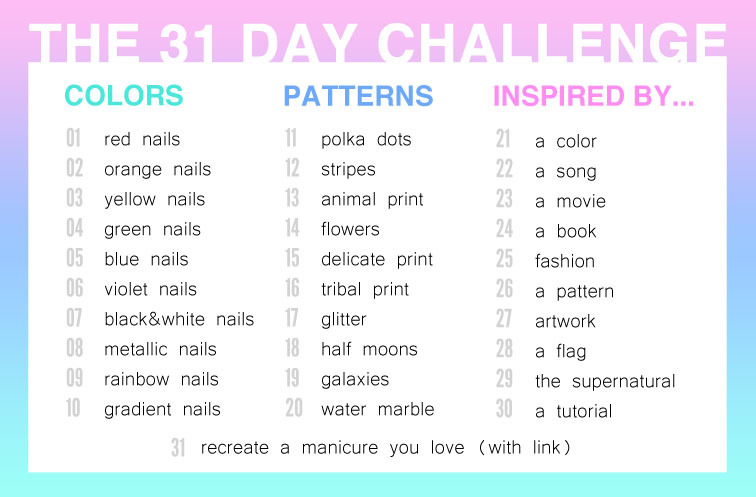 Ahhh I was contemplating doing this challenge soon, but September is such a busy month for me, I'd never be able to post every day ! Maybe November, after I'm settled at uni ! FIngers crossed ! Great job on the images btw. I started this one! Been on 'day 1: red' for a week now... Good thing I don't blog, lol! I wish I had time for this!! It's an all or nothing commitment for participation right? I could probably get 3 a week. Great idea, I probably will do that! saiba que estarei entrando no blog pra acompanhar seu desafio! Since my Blog ist only a couple of weeks old, this will be my first Challenge! I'm super excited about it and can't wait to see what everyone comes up with! Ack! 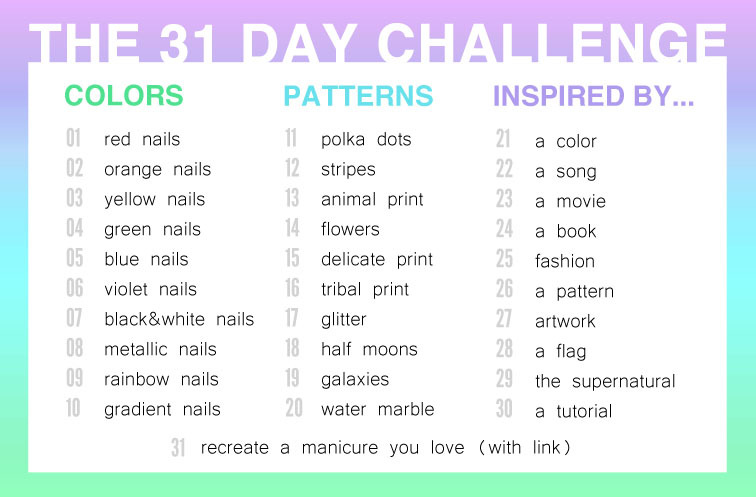 LOL I've been doing this exact challenge and I'm up to day 18... can I still join in and add my earlier manis to the list, until you all catch up to me (I'm only doing one every three days-ish)? You can count on me to be and avid 31 day challenge observer. Yay me!. Can't wait to see what u come up with! This sounds like fun! I need something like this to get me blogging more on a regular basis. Don't think I can do it every day, maybe every other day.. or 2.. Look forward to seeing your manis!! 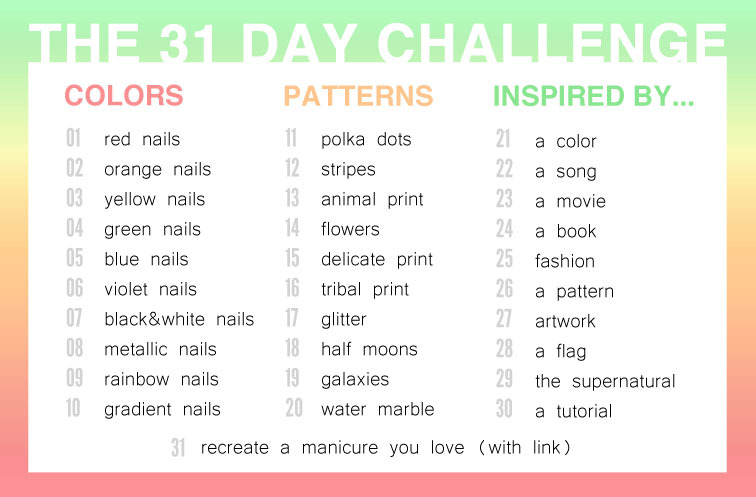 I just started my Nail Blog yesterday, so this challenge is the PERFECT way to get into blogging AND learning new techniques! I want to do this! but it wont be until october! haven't done my nails in months eek! might do it again when i have more time! Just looked through what you've done so far, SO amazing. I really think it's the best set of "challenege" manis I have seen yet and I wish I could be half as talented, 90% os patient! The glitter armor is a must do for me now, though. 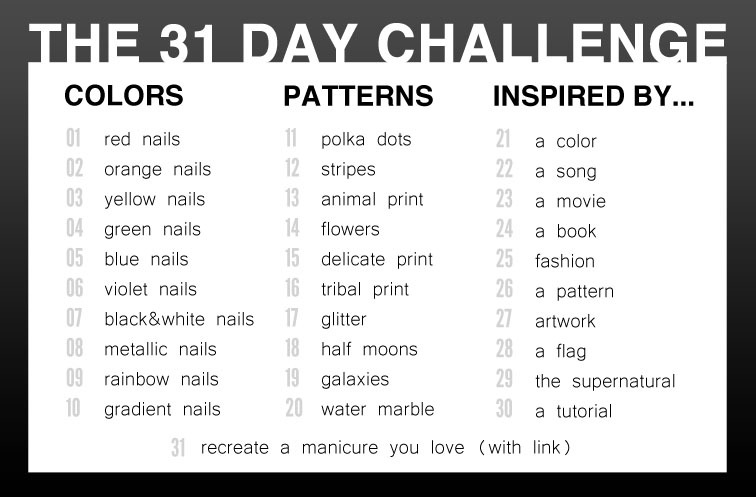 I am not good with legit nail art but if I have a spare 5 hours I could probably do that and watch Supernatural re-runs :) gorgeous! 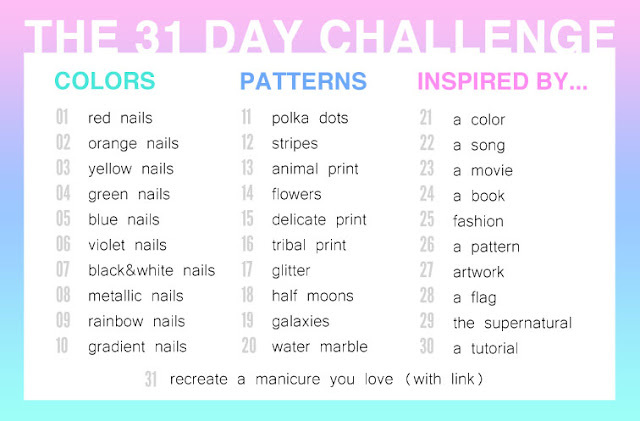 I just started my page, Phun Nail Art, and I think taking the challenge would be the perfect way to start out. I just want to say thank you in advance for being such an insperation to me.